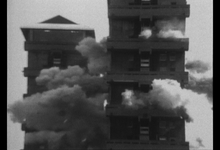 Test is a multi-screen work using three animated sequences, a person, a teddy bear and the word TEST, whose synchronicity is continually being broken by the destruction of a tower block. 4 orange letters -TEST, a teddy bear and a person all shift and move busily across 3 screens in synchronous fashion. 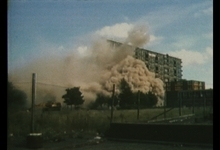 The sound of a fast ticking stopwatch beats out the rhythm of their movements until the harmony and synchronicity is broken by the thunderous explosion of a block of flats, footage of the demolition of the infamous Queen Elizabeth?s flats in the Gorbals in Glasgow. This sequence moves across the three screens disrupting the movements and attempts at synchronicity between the person, the teddy bear and the letters. The 3 synchronised screen video has been recently reworked and remastered in the LightCone Atelier 105 Residency programme in Paris. 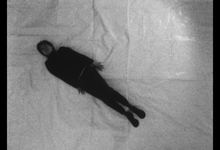 The original footage was shot in 1994, and after being shown as a 3 x 16mm film installation in an exhibition in Edinburgh, the 16mm negatives were lost. 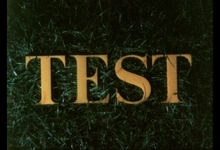 A digital scan was made from the 16mm exhibition copies cleaned and colour graded, in keeping with the original aesthetic and quirkiness of the original film.